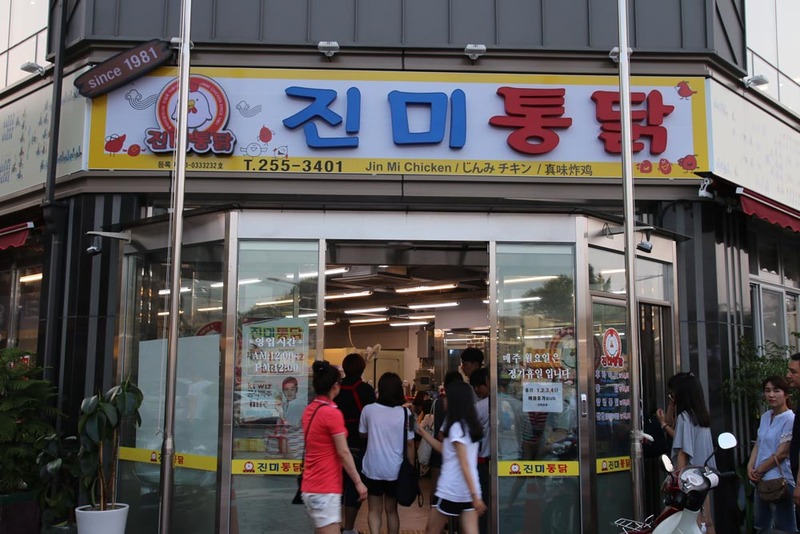 Korean people are crazy about chicken! 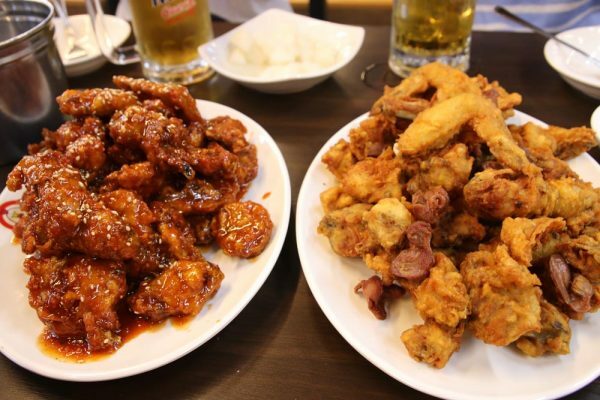 As soon as you arrive to Korea you will realize how many chicken restaurants are here. As you can imagine, there are as many chicken restaurants as varieties. From the traditional fried chicken to the roasted one, with unlimited options of sauces and toppings. I heard that there was a “Chicken Street” in Suwon, which is very popular among locals and I decided to go there. 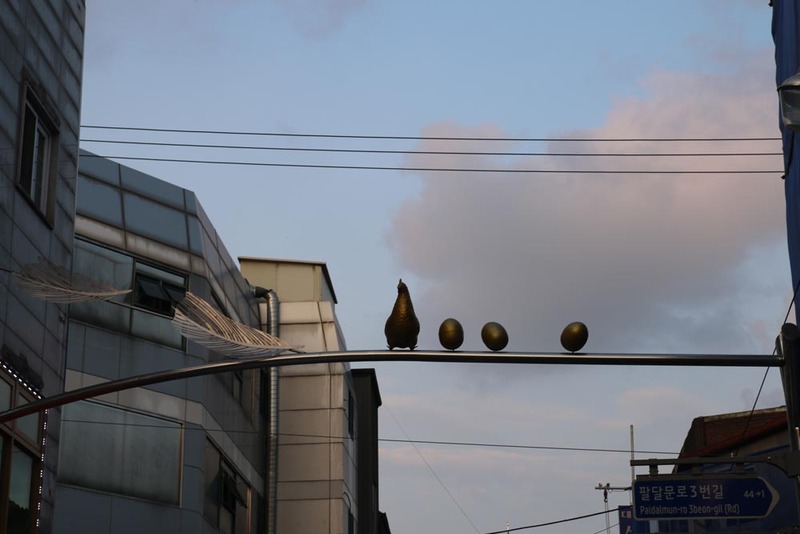 You can know that you are in the correct street if you find the iron sculpture of a chicken and 3 eggs. I decided to choose Jin Mi Chicken restaurant, as it seemed to be the most popular one. This was confirmed with the queue in front of the restaurant. There were about 15 people before us on the queue but we waited only around 10 minutes. The restaurant has 2 floors and I’d say they have room for about 100 people. 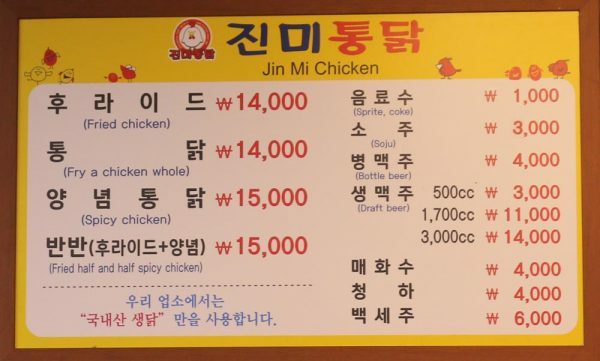 Going back to the chicken, there was a time (maybe 15-20 years ago) where there where 2 main varieties of Korean chicken; fried chicken and spicy chicken. 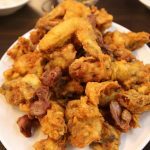 In Ji Mi Chicken, they still cook these traditional recipes. 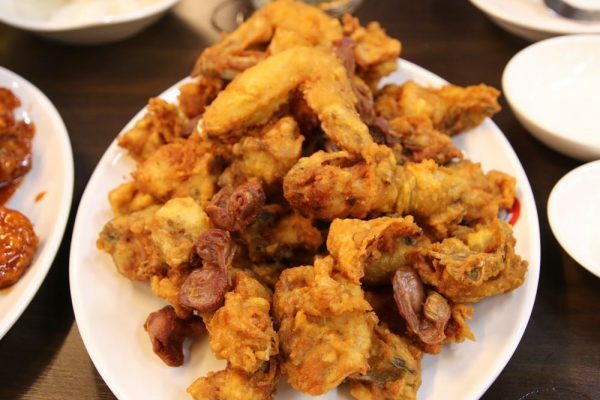 Fried chicken (₩14,000): Typical fried chicken. 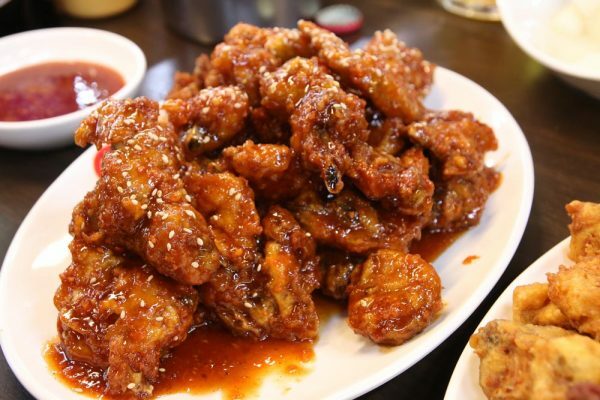 Spicy chicken (₩15,000): Fried chicken with a slightly spicy and sweet sauce, which I found it similar to sweet chilly. Whole fried chicken (₩15,000): It was sold out so I couldn’t try it. *Each portion is for 2 people. The four of us agreed that the fried chicken was better than the spicy one. The chicken was well cooked and the frying was nice and crunchy. I was a bit disappointed that the pieces didn’t have that much meat. Maybe the whole chicken could have been the best option, as it was sold out it made me feel that it was the real deal. But overall it was a nice chicken and the price is on the average. Is this the best fried chicken? It’s hard to tell. Probably not, but definitely worth a try. The restaurant is open from 12am to 12pm. From Suwon subway station: It seems that the most convenient way to get there is to take a taxi from exit 5. It will take about 10 minutes and ₩3,000. 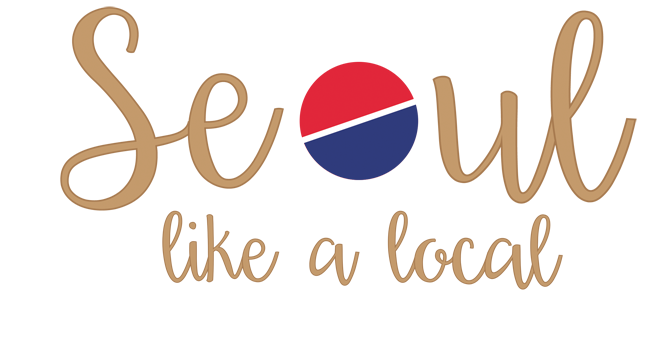 Find the cheapest hotels and hostels in Seoul.